Suwa Taisha , the most important Shrine in Shinano province, is the headquarter of 10,000 Suwa shrines and is one of the oldest shrines in Japan. The area can be divided into four shrine sanctuaries. 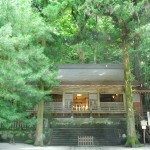 The main place is Kamisha (lit: upper sanctuary) consisted of two shrines, Maemiya(前宮) and Honmiya (本宮). 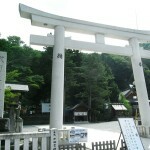 There are Harumiya(春宮) and Akimiya (秋宮) located in Shimosha(lit: lower sanctuary) area. The enshrined deities of all four shrines are Takeminaka-no-kami and Yasakatome-no-kami but generally Kamisha enshrines a male deity and? 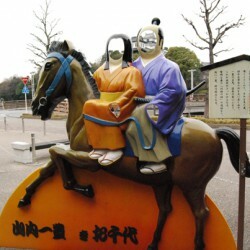 a female deity is enshrined at Shimosha. The one of most famous events in Japan called Onbashira (御柱祭) is held in the year of the tiger and the year of the Monkey. The detailed information about Onbashira can be checked out on The offcial web of Onbashira (English). In 2010 (the year of the tiger) is this festival going to be held. Access : 10 min by car from Chino Sta.